Services sector activity in India gained momentum in October, driven by an upturn in incoming new business, pushing the combined manufacturing and services activity to its highest in nearly four years. The Nikkei India Services Business Activity Index rose to 54.5 in October after dropping to 52 in the previous month. Since January 2013, the index has been higher only once this year, in August. 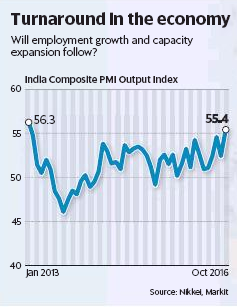 A reading above 50 on this survey-based index indicates expansion, while a figure below that indicates contraction. The sub-index measuring new business rose to its highest in over two years to 54.3 in October. Overall, the seasonally adjusted Nikkei India Composite PMI Output Index rose to 55.4 from 52.4 in September. 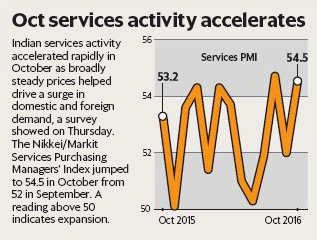 October data highlighted a sixteenth consecutive monthly rise in service sector activity across India. Moreover, for the first time in almost five years, all six monitored sectors recorded growth. The service sector has be en divided into hotels and restaurants, transport and storage, post and telecommunications, financial intermediation, renting and business activities, and other services. On the hiring front, notwithstanding the recovery, service sector employment was unchanged over the month, with almost all survey participants reporting the same payroll numbers as in September. Likewise, manufacturing staffing levels stagnated in October.